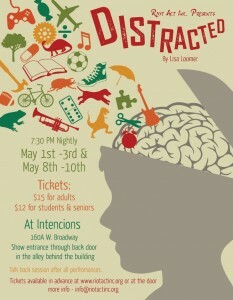 Distracted by Lisa Loomer – Riot Act, Inc.
Riot Act, Inc. presents Distracted by Lisa Loomer Thurs. May 1 through Sat. May 3 and Thurs. May 8 through Sat. May 10 at 7:30pm at Intencions (160A W. Broadway). Entrance to show is through the back door in the alley behind the building. Talk back sessions with field experts and the cast and crew of the show after the performances. Bin 22 is offering a free glass of wine with food purchase when you show your tickets to Distracted. This offer expires May 11, 2014. *Project made possible by grants from Community Foundation of JH, Wyoming Arts Council/NEA, Cultural Council of JH, Old Bill’s Fun Run, and Your donations and support.